With the available 3.5L EcoBoost engine, the 2015 to 2017 Expedition packs a lot of power under the hood, however you really wouldn't know it from the sound of the exhaust. 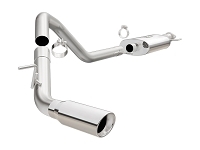 With a premium aftermarket exhaust kit from Stage 3, your 2015-2017 Expedition will sound like the beast of an SUV that it is, and if you're on the hunt for more power, any one of our high-flow exhaust kits will help you support the added power down the road. Head on over to our Intakes & Tuners category to see what we can do for your full-size SUV's power output.